See also category: Flags of Serbia. 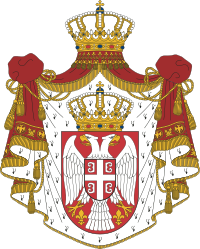 Coat of arms of Serbia. Deutsch: Die Heraldik von Serbien. English: The heraldry of Serbia. Español: La heráldica de Serbia. Français : L’héraldique de la Serbie. Nederlands: De heraldiek van Servië. Português: A heráldica da Sérvia. Српски / srpski: Хералдика Србије. Media in category "Heraldry of Serbia"